Big Data requires new approaches to data storage, management, processing, interaction, and understanding. GIS, Geographic Information Systems, attack the problem of performing geographic analysis on their datasets, but do not approach these other problems inherent to the kinds of datasets available in 2011. At the same time that the amount of data available rapidly outstrips the abilities of your average GIS system to process it, multiple disciplines are becoming more aware of their geographic needs within these data. How do we give these disciplines the tools they need? Scale horizontally to Big Data, its update frequency, access patterns, and management requirements. Integrate sensible data management solutions to scale. Vet, recommend, and federate open source geography tools to reduce the barrier of entry to using big geographic data for science. Provide pathways to accomplish common tasks, reducing the complexity of getting things done. Be able to rapidly develop and deploy prototypes and solutions. 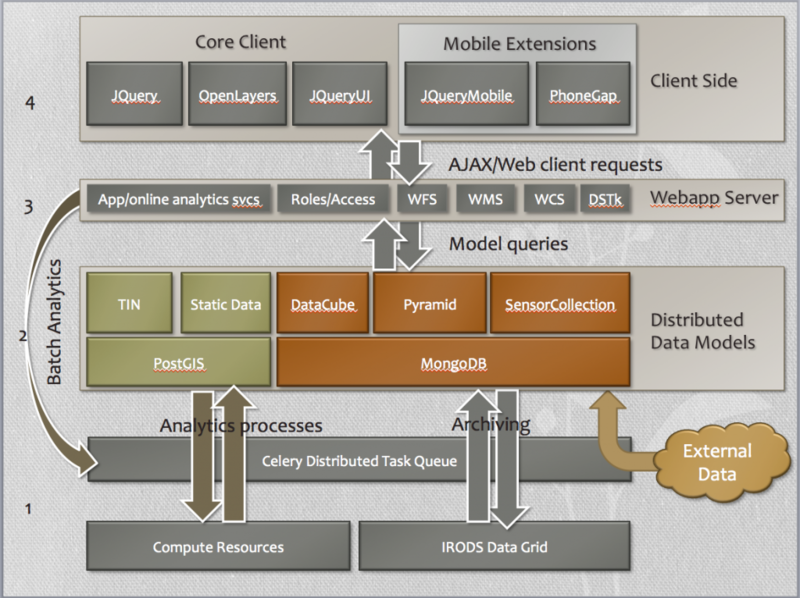 A data management and analytics layer incorporating IRODS, open source GIS software, our supercomputing resources, and a distributed task queue. A set of formalized, managed data models that encompass most common data patterns for RENCI stakeholders. A standards-based web service layer that integrates open-source GIS and provides for data interoperability and rapid application development. A federated set of client-side software that can be used to rapidly develop browser-based or mobile web applications. Geoanalytics is intended to be Open Source software. However, while it is under heavy initial development, access to the source is on a per-request basis. For more information, email Jeff Heard, jeff at renci dot org.